Little om mani padme hum charm is made of sterling silver and dangles from a bead that has a 4.5 mm hole and little hearts around the bead ring. It also has a rubber stopper so that the charm does not move around (this can be removed if desired to allow free movement). Om mani padme hum is the buddhist mantra of compassion. You can add this charm to necklaces, anklets or bracelets to make your own om mani padme hum jewelry. The 4.5 mm size is compatible with 3 mm bead charm jewelry systems (like Pandora). 1.6 cm + 1 cm bead, 3.3 g.
Om Mani Padme Hum is a Buddhist mantra of compassion, meaning, "Hail to the jewel of the lotus." In other words, we must look WITHIN ourselves to find the peace of theBuddha. The jewel is IN the lotus. Sterling silver om mani padme hum earrings. Sweet and lightweight beautiful mantra earrings. Om mani padme hum is the buddhist mantra of compassion. 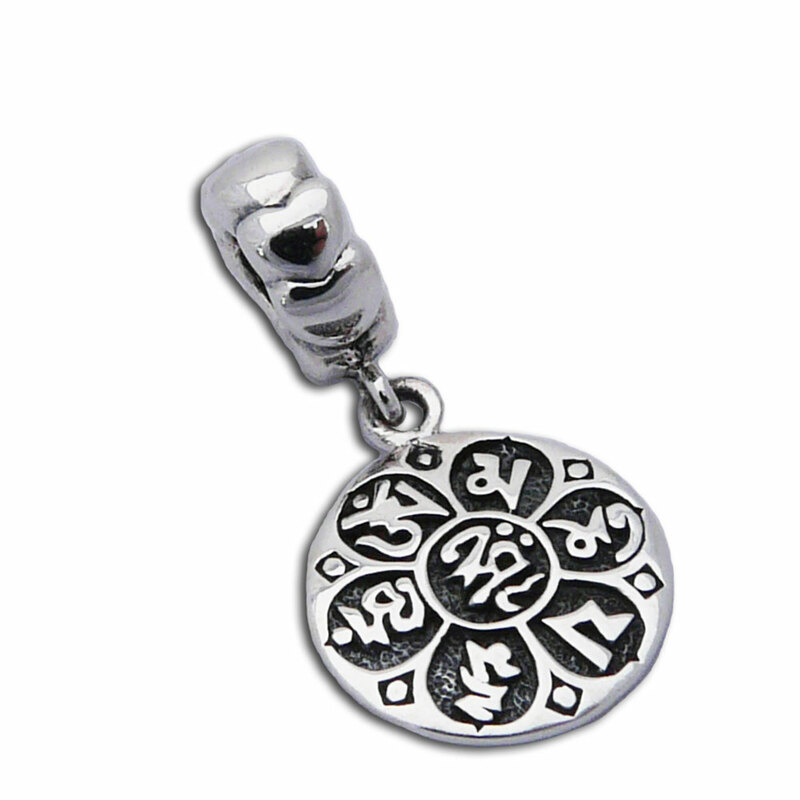 Sterling silver Om Mani Padme Hum Pendant, the Buddhist Mantra of Compassion.